Luciano Bradley, also known as "Vampire of Britannia", is the Knight of Ten. A violent and confrontational man, he is fond of provoking others and attacking without provocation; several of the Knights of Rounds appear to dislike him. He shows little care for the lives he ends, be they friend or foe, as long as he can cause destruction. In fact, he fights battles specifically because it allows him to freely kill people in public. He claims to be a "homicide genius", and carries a number of large knives which he is adept at throwing. He is fiercely loyal to the Empire, but does as he pleases most of the time, even around members of the Imperial family. He pilots the Knightmare Frame Percival. Luciano commands a unit of personal bodyguards known as the Grausam Valkyrie Squadron, a quartet of young women between the age of 15 and 25 who pilot two-tone pink Vincents. Two of their members are Liliana Vergamon and Marika Soresi, sister of Kewell Soresi. Prior to their appointment to the Valkyrie Squadron, they served under Princess Cornelia. 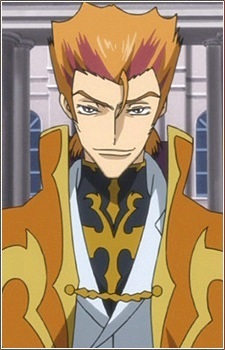 Luciano first appears shortly before the formation of the UFN; he throws a knife at Suzaku and then insults Euphemia. He later walks in on a conversation between Nunnally and Kallen, telling Kallen that she is to be used as a hostage, and threatens to harm her because her body is expendable so long as she is alive. Gino intervenes, and Luciano insults him by suggesting that his nobility is what allowed him to reach his position. During the second battle of Tokyo, Luciano destroys a number of the Black Knights' Knightmares and nearly kills Lelouch in tandem with the Grausam Valkyrie Squadron. All four Valkyrie pilots are subsequently killed by Kallen, followed by Luciano himself.